1. The average distance for the 5-6 year old players to reach top speed was 65 feet. The distance 65 feet is exactly the distance from goal line to the nearest blue line (one zone) on a regulation-sized ice surface. A regulation ice surface is 200 feet x 85 feet. That means an average player CAN reach top speed in the cross-ice scenario and CAN EASILY reach top speed in a half-ice scenario. SPECIAL NOTE: The strongest skater needed only 60 feet to reach top speed, confirming the importance of acceleration. 2. Player acceleration speeds (m/s2) increased as the ice surface size was reduced. Acceleration in the 200-foot (full-ice) sprints and the full-ice games was lower than in cross-ice and half-ice games. Puck movement and availability drives the speed of play, and young players want to “get the puck”. Observation showed that the players believed they had a better opportunity to get the puck when playing on half-ice or cross-ice, which resulted in increased acceleration in pursuing the puck. SPECIAL NOTE: When looking at overall speed of the games, full-ice games had a higher average km/h rating — 0.8 km/h higher than half-ice, and 1.5 km/h higher than cross-ice games. However, observation noted a different kind of skating taking place in the full ice game — nine players chasing the puck carrier with fewer puck touches and fewer plays being made. These observations are in keeping with findings in similar studies done by USA Hockey. 3. The average sprint speed achieved in practice is double that of the average game speed. 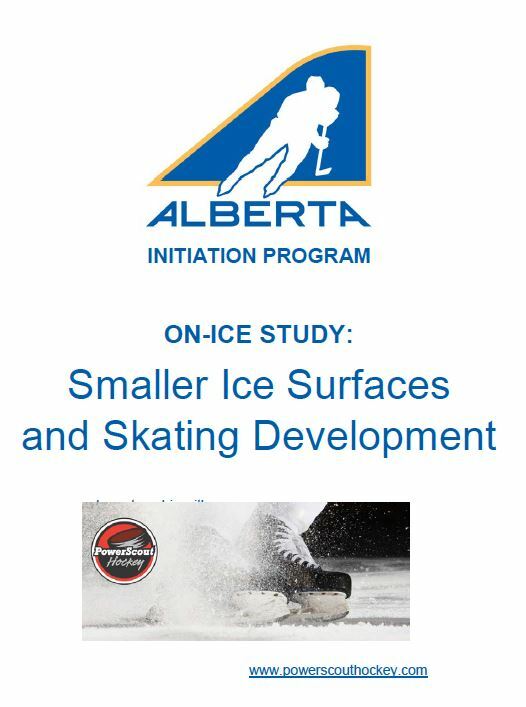 To help develop a player’s skating skills and to become a faster skater, the practice environment is generally more conducive than games. There is a greater opportunity to skate faster for extended periods of time in practice than in a game. SPECIAL NOTE: This data confirms the importance of practices, and practice to game ratios. The practice environment has a significant positive impact on skill development opportunities. A 3:1 practice to game ratio is recommended by Hockey Canada.